I'm exhausted this morning (I know, you're ready for a post that doesn't say that, right?)! But I feel like I accomplished something yesterday. 8-10 was sewing machine fixing time. 10 am until just before 11pm (when I started falling asleep while sitting up) was sewing while stopping occasionally to nurse and feed the children time. Movies were watched. There was much talk of Olivia the pig since we found two Olivia DVDs for under $4 a piece at Meijer the other day. This puts me at somewhere around 63 hours of sewing in six days. I am going to be so relieved when this craft fair is here and everything is done. And I'm going to start preparing for the December craft fair right away instead of mostly waiting until two months before to see if I'm accepted or not. Paul had his first day of classes. He's officially started his 3L year. I wish summer had been a bit longer (what was that? 5 days?). He's informed me they're going to involve "a lot" of reading (is that "a lot" for law school? Or just "a lot" in general?). And I finished quilting the last quilts, bumping my quilted quilts total up to 45. I really wanted to have 50 finished but I think I might have to be happy with 45. Yesterday morning the two hours of sewing machine repair nearly had me sick over the idea that I might now be able to handle the problem on my own. I ran to the store since I couldn't find my sewing machine oil anywhere and then got to work. I bought a oil spray that coated all the sewing machine parts and it worked really well (it had been squeaking even once it was clean... which screamed "I need oil" to me). 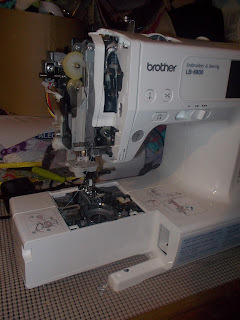 I've been asked for sewing machine tips, but I'm afraid I'm not much help in explaining how I actually fix my machines. I can tell you what I do, however. I'm not sure I'd recommend it as a strategy for anyone else, because I'm never quite sure if it will work, or if my machine is about to be killed by my attempts. When things start going wrong with my machine I take it apart and clean it. Unfortunately, most of the time, cleaning isn't the problem (I cleaned my machine three times yesterday because the fluffy fabric I was sewing sheds along cut edges until they're sewn). So I then take the machine apart and put it back together. A screwdriver removes the plates and the case on my machine and that's how I start. I remove the bobbin casing and the needle and check them both. I used to read the manual but it never actually helped at all with anything. Then I put it back together and try sewing a test piece of fabric. I might do this over and over again, for 2-4 hours before the problem is fixed (it happens about every 12 months). Sometimes it takes 2-4 hours over 2-4 days. 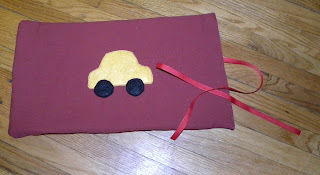 Sometimes I think I know enough that it's getting easier, and then I have a day like yesterday and I wonder if I should just take the thing in (except that wasn't really an option because I can't give up another day of sewing at this point). I fiddled with the screw on the bobbin casing until it felt right when I pulled the thread. I readjusted the thread tension a few times because it felt too tight. And I recleaned and oiled everything. Finally my sewing machine started acting like a sewing machine again. I've had this machine for over a year now, and I am impressed with how it's held up to sewing. It probably averages 30 hours a week, sometimes much more, sometimes less and so far it's still chugging along. I have a commercial machine here (a Bernina from the 1930s that was my great grandmothers, that's just beautiful!) and I want to get it's power cord repaired this summer, because I think it might better stand up to the wear and tear and I would love to sew on it. Hopefully I'll have time for a few car rolls though! Now I have four days to do bindings, finish the other bath time terry cloth aprons I have, and hopefully make a few more dresses since my store description said there would be little girl dresses and so far I've only finished two. 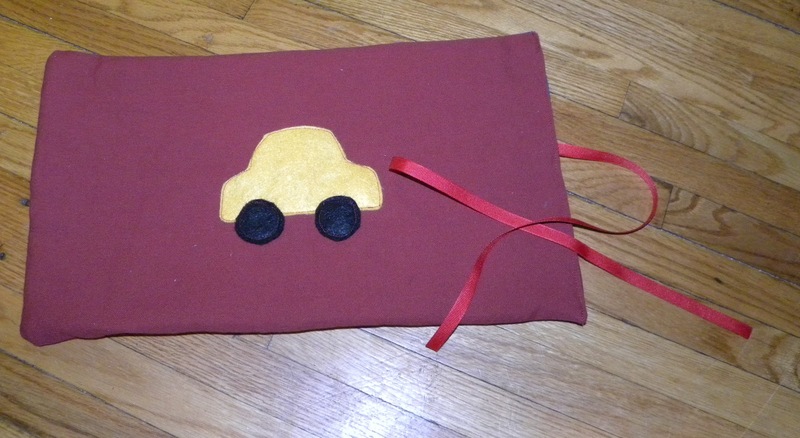 I am amazed at what a workout sewing can be. I feel like I'm spending hours working out at the gym. My pedal foot is exhausted, simply from being in the pressing-on-the-pedal position. And the sewing and not snacking has meant I've actually lost weight from all this prep. 2 more lbs to my wedding weight. With this much work to be done I might make it by the weekend! Today I brave using the bias tape maker that I got for my birthday. I have a lot of binding to do now, and fast. My parents get here on Thursday. I'm hoping I can have everything almost done by the time they arrive. So now, off to sew! I know when I used to do craft fairs that if I didn't have enough of a certain item people would take orders. 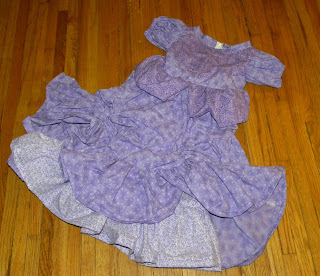 Maybe you could do that for little girl dresses.